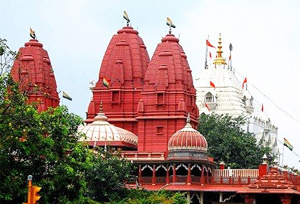 Lal Mandir popularly known as Shri Digambar Jain Lal Mandir is one of the oldest Jain temples situated in Delhi. This temple is located just opposite the famous Red Fort. The temple was originally built in the year of 1658 and it was later enlarged and renovated in the early nineteenth century. It is said that a temporary structure to house a Jain temple was being permitted to be built during the Mughal period. The main deity was of Tirthankara Parshva. The temple then consisted of three marble idols that were kept under the supervision of a Jain officer who belonged to the Mughal Army. he temple is build-up of impressive red sand stone. It consists of a Manastambha column right in the front; a small courtyard that is being surrounded by a colonnade and the main devotional area on the first floor. In this temple there are a number of deities, the main deity is of Lord Mahavira who is considered to be the last Jain Tirthankara. This temple also contains the statue of Rishabhanatha, who is known to be the first Tirthankara, and that of Lord Parshvanath. It is a very peaceful and serene place for offering prayers. The temple is composed of detailed carvings and paintworks in the ante chambers. Devotees from across the world come for praying and offering fruits, grains, rice as well as candles. These lighted candles and the glazed paintwork create a serene atmosphere inside the temple premises. There is also a bookstore situated inside the temple complex that contains books related to the Jain culture and religion from all over the world.